By now, you’re probably realizing – as I did – that just maybe spring breaks aren’t as fun for grownups. 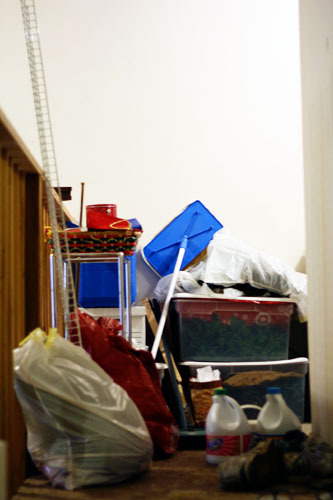 Cleaning out closets and storage spaces? For a week? Sure, why fly to the tropics, staying in a little bungalow on the beach, enjoying the great outdoors, when we’re having so much fun right here? This exciting adventure took place in our garage. Basically the entire time I’ve lived here, it’s been a dumping ground. 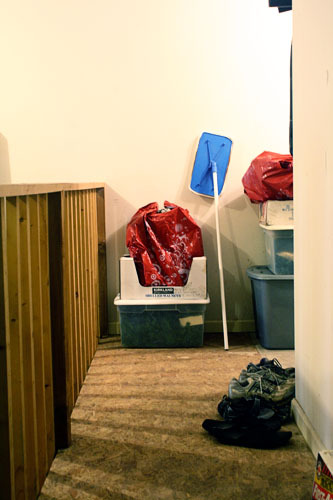 Therefore: six years of dumping ground, without a single big clean-out. 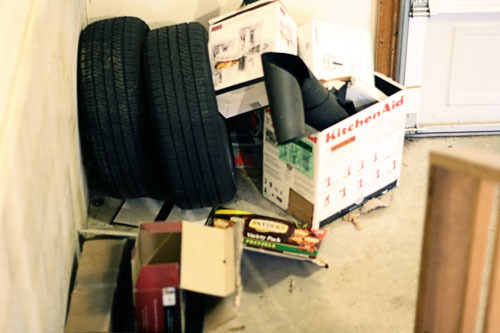 Sadly, I became used to having a dirty, cluttered garage, so it never bothered me enough to do something about it. Horrifying confession: I once left a watermelon on the workbench – which is bizarre enough, right? – for so long that it become rotted and full of insects. (Oh hey, Mr. P, guess I never told you that before! It’s okay, you weren’t married to me then! I only used to be that disgustingly negligent!) Even then, with a rotting watermelon on my workbench, I wasn’t like, wow, it’s time to get this place in ship-shape! More like, THIS IS INDEED A TERRIFYING PLACE. ONCE I HAVE DISPOSED OF THIS HORROR I AM NEVER COMING OUT HERE AGAIN. 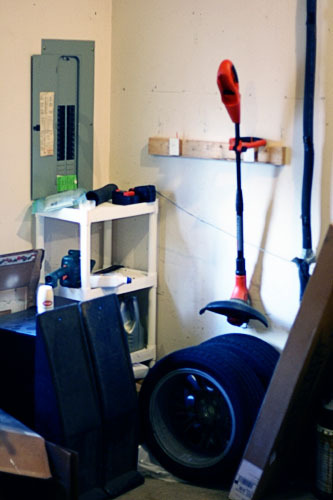 Which is weird, because I actually do work out in the garage. That’s where I do my painting and staining and crazily-determined sawing. 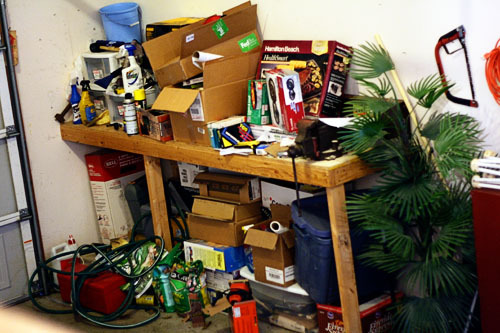 But instead of making it a nice workspace, or at least sweeping the damn floor so I wouldn’t have to worry about getting grass clippings on my newly painted cabinet doors, I just sort of... shoved all the badness to the perimeter. And then ignored it. That’s the “workbench”. It’s, uh... it’s in there somewhere. And now you know why all those sawing photos from the laundry room re-do were zoomed in! I will admit to you: it wasn’t until I took that “before” photo right there and saw it in the viewfinder that I freaked out with the realization, “Whoa. That is my house! THAT IS MY HOUSE! I have let my house look like that! Holy crap, what was I thinking? !” The photo was a slap in the face. The years of ignoring that disaster were immediately over. Boom. WORK TIME. HIGH FIIIIVES! And it’s going to look even better; those few boxes by the garage door are on Mr. P’s to-do list, and then they’ll be outta there too. 2) That spraypaint can is actually sitting on a mini-fridge. That you cannot even see let alone use. 5) There’s actually a door back there. Somewhere. I think, at least. It’s been so long, it’s hard to remember. You guys! Look how empty! I’m so happy. So, so happy. 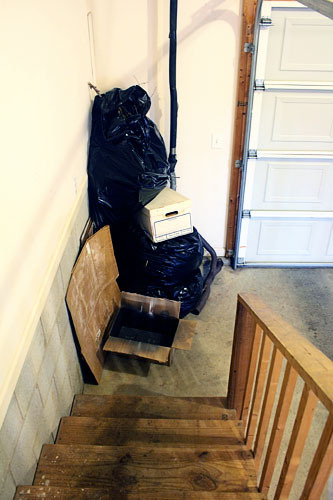 The black bag in the corner holds the deck furniture cushions – mostly destroyed by the weather, but at least they’re inside now. And that reddish thing on the left is a shelving unit, which will be taken to Goodwill today by a very generous, truck-owning friend. More wheels, more hoarded boxes (what is wrong with me?). 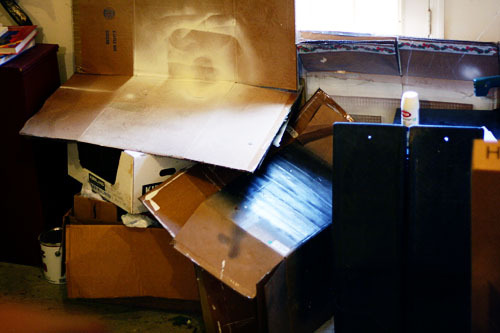 Only those boxes held trash from the kitchen floor installation. Which we finished in, you know, eighteen months ago. I die. Okay, that is... less impressive. But every one of those items will be going to recycling or next week’s trash! The can is just too full right now, but I couldn’t wait to show you. What’s that tall white thing? Oh, just the shelf I un-installed from the laundry closet... last July. That small pile at the end is going to my parents, then the walkway will be totally clear! Well, except for the yard shoes, but those are banned from the closet. On the right, the HVAC and water heater (boring), and in the back, an impossible-to-remove Penn decal (WTF, previous homeowner?). 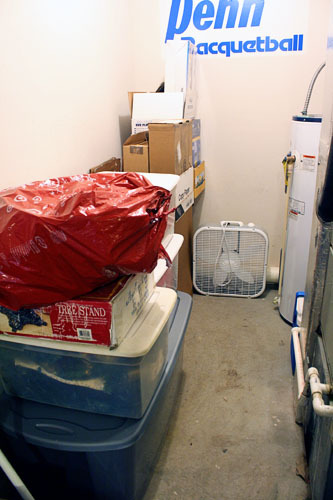 But on the left, immaculately organized holiday décor... and MORE CARDBOARD BOXES. They are everywhere. At least now they are organized and spider-free! 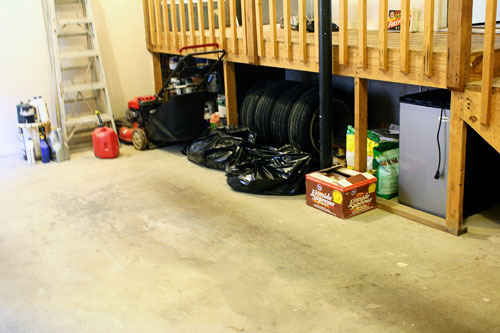 The benefit to stashing those things under there is that you can’t see them if you just peek in the garage... like a prospective homebuyer might do! 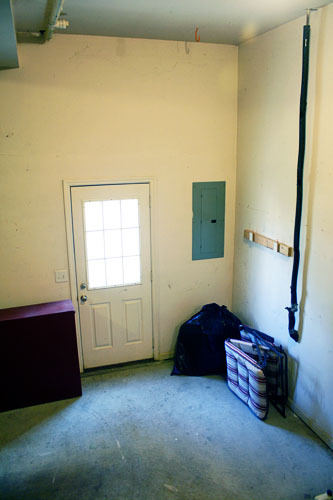 So the garage isn’t quite as empty as the above photos suggest, but at least it’s mostly out-of-sight. And it’ll be even better once a few other things are discarded (we have to make a trip to the hazardous waste disposal for the paint, oil, and propane cans on the left, and our friend is taking the de-spiderified former Paradise City firewood in the black bags). 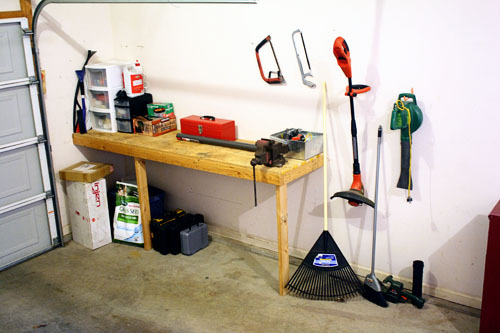 So for once, I have a de-cluttered, actually clean garage! I’d love to paint the walls – they’re pretty banged up – but that’s pretty low on the priorities list, with limited time and money. So, I’m calling it done once we send off those last few items, knock down one last cobweb or two, and give it another good sweeping. It’s still a great end result... and that totally makes up for the rotted watermelon, right? Okay, maybe not. Just forget I told that story, then. Your Paradise City reference made me laugh so hard I snorted. I love following your home-owning adventures! !